The major themes running through the work of Rudy Adrian are nature's earthly majesty and the navigation of space. On Par Avion (78'45") Adrian adds a third dimension, questions about his place in both. 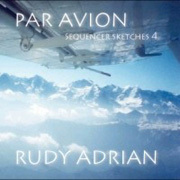 As this CD is part four of the Sequencer Sketches series, the first five tracks are centered on the animated and dynamic skipping sequencer patterns Adrian has become so good at producing. Rhythms build, layer upon layer, as each piece plays out - endlessly melodic, dreamy and light. The musical progression repeats in dozens of variations to create an intoxicating architecture of sound. The remaining two tracks are a sobering 30 minutes worth of music made in a reflective mood. 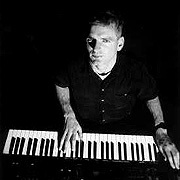 Patient listeners are richly rewarded as every tone is colored and inflected with the mythic qualities of a natural synthesist. This new territory is particularly searching. Onerous to describe, wondrous to hear, these slow movements are radiant and still with an inexpressible air of mystery. This music has been meticulously designed and executed in an attempt to illuminate the inner darkness. The expressive potential for this region seems limitless, but who will reach? In Rudy Adrian's world beauty is still relevant, and people still possess the ability to recognize it.